One day, looking for cheap sensors on ebay, I found this interesting board which contained everything I was looking for. It basically consists of a 3-axis accelerometer (ADXL345), a 3-axis magnetometer (HMC5883L), a 3 -axis gyroscope (L3G4200D) and a barometric pressure sensor (BMP085). My plan is to build an Inertial Measurement Unit (IMU) (or maybe I should call it Attitude and heading reference system (AHRS)) and in the process learn how to interact and interpret the information all of this sensors provide. The fact is I have some experience using IMUs since I used one on my master thesis and another one on the Avora AUV, but the fact is they come preprogrammed and there is not much point in working with the raw sensor data unless you want to improve the measurement or give it another use. For this project I am also using an Arduino Duemilanove, for that reason I wanted to call it ArduIMU, but there is already another project with the same name, so I will have to find another name (suggestions would be appreciate d). 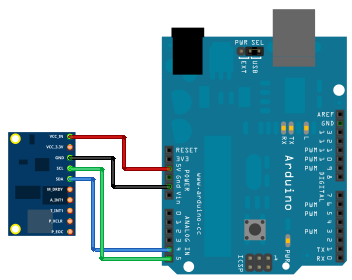 Connecting the sensor board to the Arduino is pretty straightforward, every sensor has an I²C interface so you can access each of them using the Arduino Wire Library. The drawing was done using fritzing, on which I created the corresponding custom part for this board, although I did something wrong and it does not conform to the fritzing graphic standards. This will be the first of a series of posts I plan to write about this project, since there are several steps I need to take in order to fully understand each sensor and several more to combine them in order to improve accuracy. In this post I want to talk about the accelerometer and how to obtain the roll and pitch angles from it, which is a process that can also be called tilt sensing. Accelerometers are devices that are capable of measuring the acceleration they experience relative to free-fall, the same acceleration living beings feel. As a consequence, accelerometers are incapable of measuring the acceleration of gravity, but can be used to measure the upwards acceleration that counters gravity when at rest. This acceleration is measured as on the z-axis, when both pitch and roll angles are zero, but when the sensor is tilted either the x-axis or the y-axis experiences a component of the upward acceleration, whose magnitude depends on the tilt angle. For more information about where these equations come from, you can read the documentation I include at the end of this post. As you can see, the denominator of the pitch equation is defined to be always positive, so the equation itself only provides range, which is exactly what is expected for the pitch angle. In contrast, the roll equation provides range. 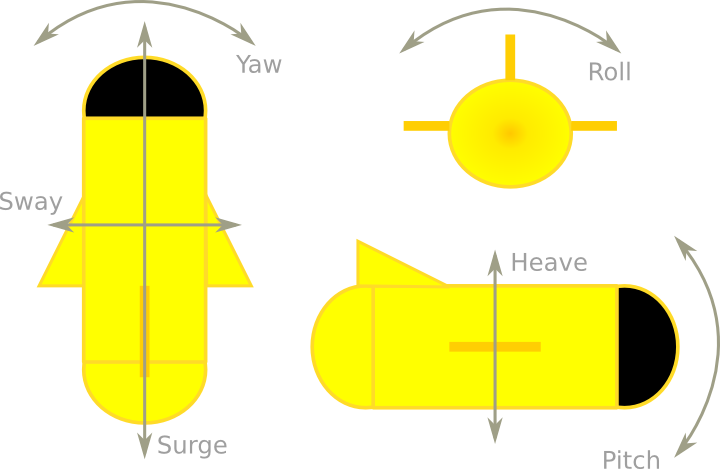 It is important to take into account that when the pitch angle is 90º, the surge axis (roll) is directly aligned with the gravity vector, thus we cannot measure the roll angle anymore, this is what is called Gimbal Lock. Also, be aware that the roll equation is undefined when both and are equal to zero, and that for each possible value of the calculation done inside the arctan function there are two valid solutions, not only on the roll but also on the pitch equation. These problems can be easily solved in code by using the function atan2, which eliminates the angle calculation ambiguity by taking into account the quadrant. Where is our filtered signal, the previous filtered signal, the accelerometer reading and the smoothing factor. It probably may seem obvious, but filtering should be done to the accelerometer readings before calculating the angles, instead of to the angles themselves. Regarding the smoothing factor, the lower we set it, the more it will take for the angle to stabilize, so we should not set it too low because then we could lose real-time behaviour. With this I mean that the reading will not correspond to the real angle until it stabilizes, and this could take some time. I developed a small library to interface with the accelerometer, even though at the moment I have only implemented the basic functionality, I plan on supporting all of the device features. You can find it in my gitlab account. Thanks to the library, the code is pretty straightforward. It just reads the sensor accelerations which are already converted into gs by the library, applies the Low-Pass filter and then uses the roll and pitch equations to calculate the angles.